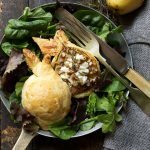 Delicious, easy and pretty, these Baked Puff Pastry Pears with Goat Cheese are topped with toasted pecans and drizzled with honey or maple syrup. 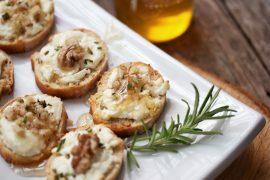 A great appetizer for entertaining! I’m not going to lie. I like pretty food :) I’m solid in my belief that we eat with our eyes first and whenever I have the opportunity to pretty something up, I’m all over it! But only to a point. I’ve learned over the years, that there is a point of diminishing rewards, so while I love to make things special, I want special in a reasonably fast and easy way. These Baked Pears with Goat Cheese and Honey are a perfect example of this idea. While they may look like they would be time-consuming and fiddly, they are in fact, super simple to make. Simply halve the pears, remove the core, cut a rectangle of store-bought, pre-rolled puff pastry and fit it over the pear half. Grab a knife to trim the excess and tuck it snug. Use a bit of the trimmed excess to make a little leaf and bake. Once cooled, simply fill with goat cheese, sprinkle with some toasted pecans and drizzle with honey. As for presentation, you can serve them on a bed of greens (dressed or not, as you like), as shown here, or simply alone on a plate with a pretty drizzle of honey. One pear half is enough, per person. I just included two here so you could see both sides of the pear. 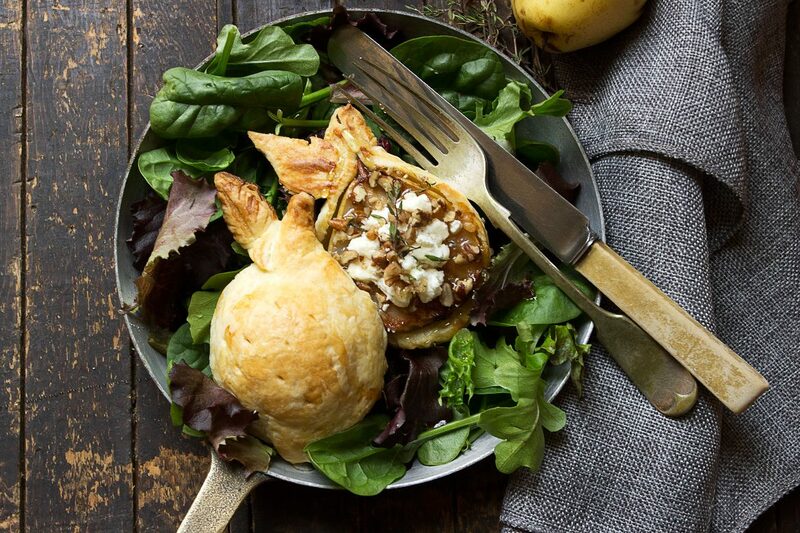 Savoury isn’t the only option for these puff pastry pears. Fill with a scoop of ice cream, top with pecans and drizzle with honey or maple syrup for a quick, easy and pretty dessert. Of course, always important for entertaining is the make-ahead-ability of things like this. So yes, you can do all the forming ahead and then cover and refrigerate and bake when ready. Be sure to remove from the fridge for about 15 minutes before baking. These take just a short time in the oven, but allow to cool a bit before filling. 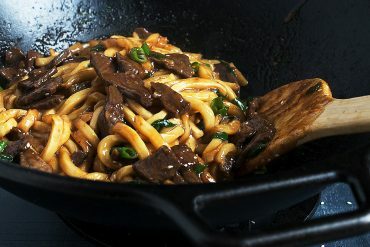 They can be served slightly warm or at room temperature. Fill just before serving. 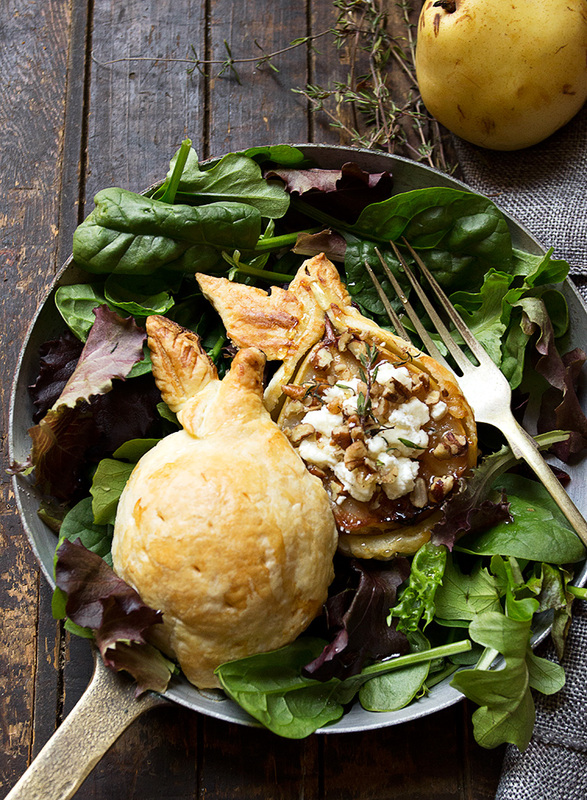 Delicious and pretty, these puff pastry wrapped pears, are also easy. 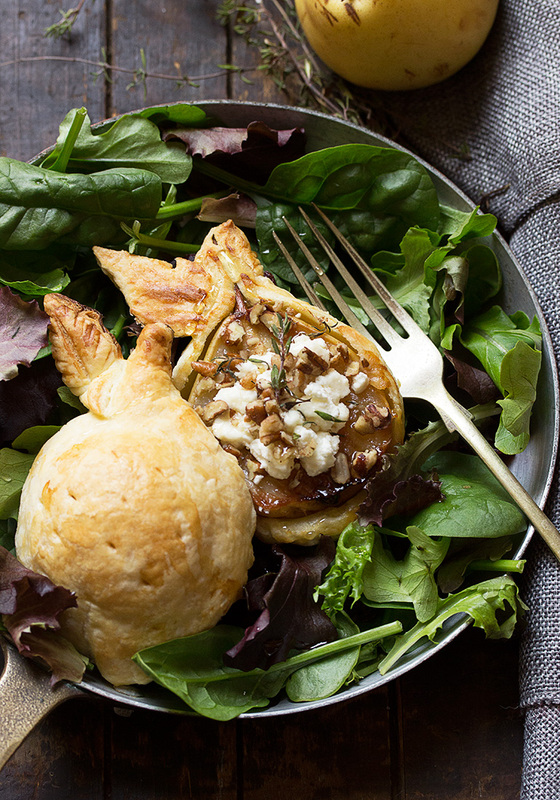 Filled with goat cheese and toasted pecans and drizzled with honey or maple syrup. A nice appetizer for entertaining! Preheat oven to 400 F. Prepare a baking sheet with a silpat or parchment paper. Cut pears in half from top to bottom. Using a spoon, scoop out the cord and remove the woody spine leading up to the stem. Place pear half cut side down on parchment lined baking sheet. Place thawed puff pastry sheet on a cutting board and cut rectangles slightly larger than the height and width of your pear halves. Take one rectangle and place over pear half. Using a sharp knife, trim pastry to fit the pear, tucking/pleating the pastry a bit to make it snug. Repeat with all the pear halves. Use the trimmings to cut small leaf shapes and score the top of the leaves a bit to make veins. Press on to pears. When all pears are covered, use a sharp knife to make small slits on the top of the pears, to prevent puff pastry from puffing up too much. Brush pastry with milk or cream. *If making ahead, cover and refrigerate to bake later. 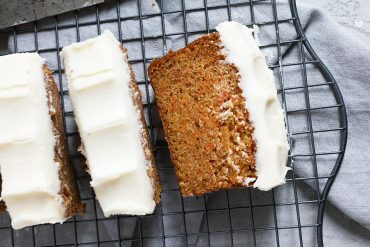 Remove from fridge for 15 minutes before baking. Bake in pre-heated oven for 15- 20 minutes, or until golden. *Note: Check at the 15 minute mark. If leaves are getting too dark, place a small piece of aluminum foil loosely over them to prevent further browning. When golden, remove pears from oven and allow to cool at least 5 minutes. Meanwhile, toast pecans in a dry skillet on the stove-top over medium heat, swirling and stirring until fragrant 3-4 minutes. To serve, fill pear cavity with goat cheese crumbles. Sprinkle with pecan pieces. 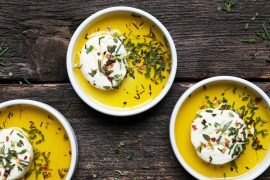 Garnish with fresh thyme sprigs and drizzle with honey or maple syrup. 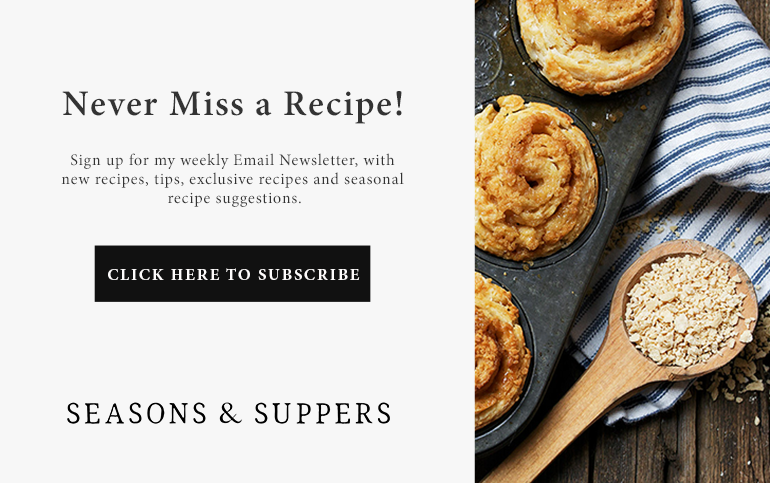 Your recipes and photographs are stunning! Thank you! Thanks Lorie and yes, it would absolutely be nice at breakfast as well! Jennifer these appetizers need to be on the front of a magazine cover, so beautiful. Great tip on prepping before your guests come. I pinned this twice, once for an appetizer and once for a dessert. Love it! These are awesome! They do look like they’d be tricky but in reading the directions, I see that they really are easy. 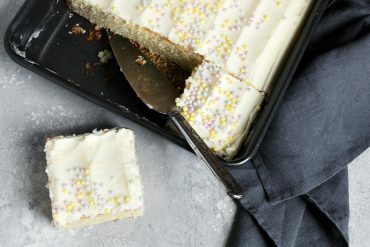 I love that and love the versatility of the recipe too! Thanks so much, Chris :) The flavours were so fabulous and so many ways to dress it up! These gorgeous pears look so completely delicious I cannot WAIT to make them! I love simple, elegant dishes like this – thanks for sharing and I bet a chilled glass of Sancerre or unoaked Chardonnay would complement the pears beautifully!!! So gorgeous! I love pears (and puff pastry, of course!) 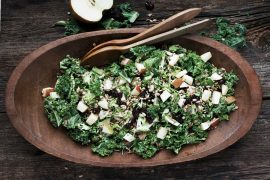 – I’d be happy serving this over a bed of greens and calling it a meal :). I love pretty food too and something simple, but simply delicious, is perfect in my book! These are just gorgeous and creative. I love to play with my food! 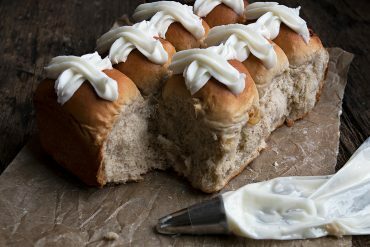 How fabulous are these, they’d be a huge hit on the Thanksgiving table, and I love the sweet option! Thanks Sue and yes, so nice to have things that can be used for both sweet and savoury! This looks amazing! 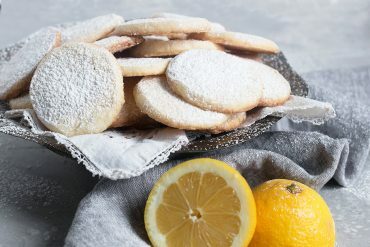 I am going to make these for an early family Christmas dinner in a couple of Sundays. Your website does not disappoint. Thank you Jennifer. Wow! This is definitely pretty food Jennifer! Such a creative dish. What an elegant looking dish.